Allen and Heath Xone:DB2 DJParts - All Variety of Parts that DJ Needs. The Xone:DB range exploits the potential of digital mixer technology to bring you maximum DJ creativity. A key element is what we believe to be the highest quality and most sophisticated FX engine in the DJ market. Originally developed for the iLive pro touring system and rated by some of the best ears in the business, the FX algorithms have been painstakingly optimised for DJ use. The first mixer to get the new FX engine was the Xone:DB4 – an unapologetic monster of a mixer with an FX engine on each channel. Now the Xone:DB2 captures the essence of DB4 in a stylish, accessible, affordable format. :: Massive FX Library Xone:DB2 has more than 50 FX presets divided into 5 FX types: Delays/loopers, Reverbs, Resonance, M odulation and Damage. These are studio grade FX – in fact several legendary producers already use the DB range FX in their recordings. There are plans to continue building the FX library in future firmware updates. :: Expression + Wet / Dry The Expression and W et / Dry controls give intuitive, hands-on control for everything from subtle FX washes to total transformation. :: Editable FX Parameters. For those who want to drill down further, individual FX variations can be further modified via the rotary controls under the screen. Input Matrix Each of DB2’s four input channels has a full input matrix that can select from four analogue (Line or RIAA), four USB, or two digital sources, allowing for a wide variety of audio sources to be connected simultaneously. The same source can also be selected on multiple channels. Trimodal EQ Xone:DB2 adopts the fresh approach to creative equalisation introduced on DB4. The EQs can be used in three different modes - standard asymmetric EQ (+6/-26dB), total Kill (+6dB/OFF with a 24dB/octave slope), or High-Pass/Low-Pass filter with adjustable resonance. Mic/Line Input With 2 band EQ, gain, cue and mix level and with full access to FX. High Visibility OLED Display Tested for maximum clarity whether playing on a sundrenched Balearic beach or in a Berlin basement, the high contrast display shows FX selection, BPM and menu setup functions. Lightweight chassis Made for life on the road, Xone:DB2 is robust enough for touring, and its lightweight aluminium chassis helps ease the arm-ache. MIDI control All controls (except M ic and Phones level) send MIDI data. The mixer can double up as a MIDI controller for DJ software such as Traktor Pro and Ableton via the MIDI shift button, which allows the FX selection controls to send MIDI data without changing the mixer settings. 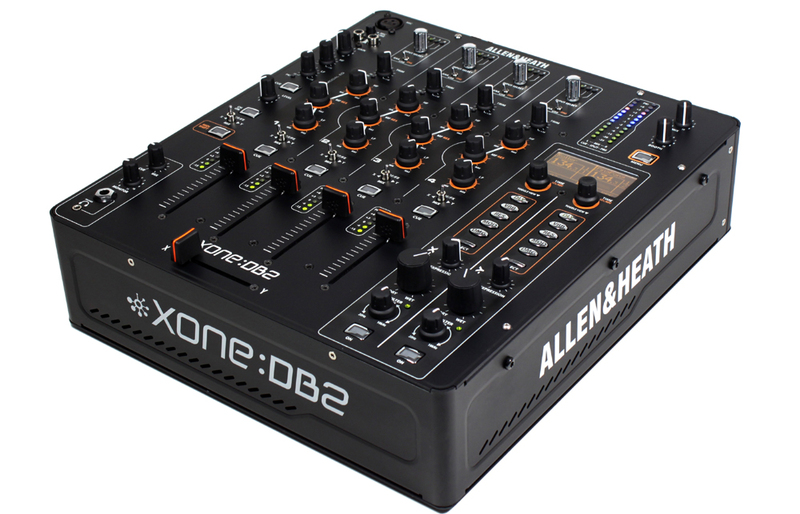 X:LINK Xone:DB2 can integrate smoothly with the new Xone:K2 software controller via Allen & Heath’s proprietary X:LINK protocol.